Doron Lavee holds a PhD in Public Economics from the Ben-Gurion University, an MA in Economics and an MBA in Business Administration and Economics from the Hebrew University. He is a member of the Department of Economics and Management at Tel-Hai Academic College. He also serves as a Partner and General Manager of Pareto Group Ltd. He is a well-known expert with over 22 years of experience in economic and environmental consulting, financial advisory and strategic consulting in various fields, including issues related to economic efficiency and the periphery. He has extensive experience in managing complex projects and large-scale environmental economic consulting and conducting projects for the public and government sectors, including government ministries, local authorities, government corporations and public agencies. Main research fields are economics and public policy, in particular analyzing water system management, environment, transportation, industry, foreign trade, small business, employment, land policy and agriculture. My research includes cost-benefit analysis of various alternatives of regulation and policy measures, market structure analysis, policy measures effects on the consumers, the environment and the business sector. The research includes both theoretical models and analyzing empirical data. Research examples: solid waste management; noise from roads; air quality; evaluation of non marketable land; impact of policy measures on water consumption; cost-benefit analysis of upgrading waste water desalination; and employment of Arab women. Dr. Lawrence Bank is an Adjunct Professor in the Grove School of Engineering at the City College of New York (CCNY) and a part-time Project Director at the Research Foundation of the City University of New York (RFCUNY). He is also has a consulting practice - LCB Consultants LLC in New York City.He is a Distinguished Member of the American Society of Civil Engineers (ASCE), Fellow of the American Concrete Institute (ACI) and a Fellow (and Past President) of the International Institute for FRP in Construction (IIFC). National Science Foundation’s Industry/University Collaborative Research Center on Resource Recovery & Recycling. Dr. Brajendra Mishra is the Kenneth G. Merriam Distinguished Professor of Mechanical Engineering and Director of the Metal Processing Institute at the Worcester Polytechnic Institute [WPI]. Dr. Mishra is the Director of the National Science Foundation’s Industry/University Collaborative Research Center on Resource Recovery & Recycling. Brajendra received his Bachelor of Technology degree in Metallurgical Engineering from the Indian Institute of Technology in Kharagpur, India and his M.S. and Ph.D. in Materials Science from the University of Minnesota in Minneapolis. Prior to joining WPI, Prof. Mishra was a Professor of Corrosion and Physico-chemical Processing in Metallurgical & Materials Engineering at the Colorado School of Mines [CSM] where he now serves as a University Emeritus Professor. Dr. Mishra has over thirty years of research experience in materials recovery and recycling, molten salt pyrometallurgy and electrochemistry and has many contributions to the application of these technologies to materials development and processing. Recycling & molten salt pyrometallurgy and electrochemistry. Muscolo Adele graduated in Biological Sciences (MSc), has completed her PhD in Food Science at the age of 26 years at the Policlinic Federico II University of Naples, Italy. In 1988 she started is professional carrier as researcher at “Mediterranea” University of Reggio Calabria where she is still working as Full Professor in soil chemistry and ecology. Since 1990 she is reviewer for International Scientific Journals and since 2008 she is evaluator of projects for European Community, International Funding Research Agencies and Italian and Foreign Research Ministeries. She is chair of many Regional, National and International research projects.. She is examiner of international PhD dissertation. She published more than 180 papers in international journals with IF and has been serving as an editorial board member of many International Journals. She is Associate Editor for JFR. Jalil was born in 1962 in Pabna district of Bangladesh. He enjoyed first grade junior scholarship, Education Board scholarship, and BUET merit scholarship. He received his B.Sc. in Civil Engineering in 1986 from BUET. He obtained his M.Sc. in Civil Engineering in 1988 specializing in Environmental Engineering from the same university. He received his Ph.D in Civil Engineering in 1993 from Tokyo University, Japan under Asian Development Bank Scholarship. He conducted post-doctoral research on water management in Loughborough University, UK under Commonwealth Fellowship during 2005-2006. Solid waste management, grey water recycling, water and wastewater treatment technologies, and rain water harvesting. Experience in Solid waste management, (research labs, municipal and industrial waste) as well as social aspects of solid waste management and technology subjects. 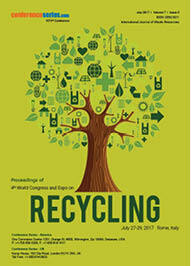 Participates in various international conferences on solid waste management, as attending, session chairwoman, and speaker. Denis Rodrigue obtained a B.Sc. (1991) and a Ph.D. (1996) in chemical engineering from Université de Sherbrooke (Sherbrooke, Canada) with a specialization in non-Newtonian fluid mechanics. In 1996, he moved to Université Laval (Quebec City, Canada) as an assistant professor of chemical engineering where he is now full professor since 2005. Professor Rodrigue has been the vice-president (2002-2003) and president (2003-2005) of the Quebec Polymer Society (QPS), and an active member of the Canadian Society for Chemical Engineering (CSChE) as the student faculty advisor since 1997. He is currently serving on the Advisory Editorial Board of the Journal of Cellular Plastics and Cellular Polymers. Carlos Thomas is currently working as a professor in the Laboratory of Materials Science and Engineering - LADICIM at University of Cantabria, Spain. 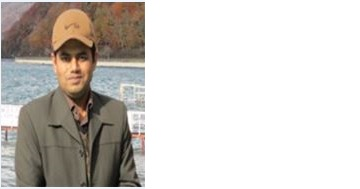 He completed his Phd in civil engineering and is expert in Structural Recycled Concrete for Structural Application: Durability in Marine Environment and Fatigue Behavior. His research focuses on the physical characterization, mechanical and durability of materials, from the microstructural level to its behavior in service. Dr. Gilbert C. Sigua is a Research Soil Scientist at the USDA-ARS Coastal Plains Soil, Water, and Plant Research Center in Florence, SC. His research program focuses on both the short-term and long-term solutions to enhancing agricultural and environmental sustainability and improving water and nutrient management in humid region. Gilbert is a nationally and internationally recognized expert and authority in his field because of his work on agronomic, soil quality, water quality and environmental management research as evidenced by his various international projects in Brazil, Australia, Philippines, Japan and Cambodia. Dr. Sigua’s scholarly achievements and expertise have been widely recognized through numerous honors and awards. As a testimony to this, he was recently awarded major fellowship awards, to wit: a) Fellow of American Society of Agronomy; b) Fulbright Fellow; c) Japan Society for Promotion of Science Fellow; d) “Balik Scientist” Fellow; and e) Fellow of Soil Science Society of America. Currently working as a Professor, College of Environmental Sciences and Engineering, Peking University. Completed his Ph.D., Center for Environmental Science, Peking University during 1987 - 1990. And M.S., Department of Technical Physics, Peking University 1982 - 1985. Bachelors degree in Department of Technical Physics, Peking University. From 2007 - 2012 he appointed as a Dean, College of Environmental Sciences and Engineering, Peking University. Professor & Executive Dean, College of Environmental Sciences, Peking University during 2002 - 2007. From 1997 - 2002 Professor, Center for Environmental Sciences, Peking University. Director, Center for Environmental Sciences, Peking University during 1996 - 2002. Associate Professor, Center for Environmental Science, Peking University 1992 - 1997 and also worked as a Visiting scientist, Energy research Centre of the Netherlands during 1992 - 1995. Lecturer, Center for Environmental Sciences, Peking University 1990 - 1992. Research associate, Research Center for Eco-Environemental Sciences, Chinese Academy of Sciences during 1985 - 1987. Dequan Xiao joined the faculty of the University of New Haven in August 2013. His research interest is focused on developing new theoretical and computational chemistry methods based on quantum chemistry and statistical mechanics to study energy transfer, nonlinear optics, and catalysis for the applications in renewable energy science, soft condensed matters, and biophysics. Dequan Xiao will teach Physical Chemistry and Physical Chemistry Laboratory in the fall of 2013. Education: Postdoctoral associate, Theoretical and Computational Chemistry, Yale University, 2009-2013 Ph.D., Theoretical and Computational Chemistry, Duke University, 2009. M.S., Industrial Chemistry, University of Central Florida, 2003; M.S., Polymer Chemistry and Physics, Sichuan University (China), 1999; B.S., Chemistry, Sichuan University (China), 1996. Also he is the member of the following associations: Member, American Chemical Society. Member, American Physical Society. Member, Sigma Xi, the Scientific Research Society. Li Guangming is currently working as a professor in Tongji University, China. In 1985, East China Institute of Chemical Technology (now the East China University of Technology) Department of Chemical energy graduate, bachelor's degree in petroleum refining engineering; graduated from the school in 1988 petroleum processing, received a master's degree organic chemical disciplines; graduated from the school in 1990 the Department of Petroleum Processing PhD in organic chemical disciplines. July 1990 Tongji work played so far, worked in the Department of Chemistry (1990-1999), Higher Technical School (2000-2001) and the Institute of Environmental Science and Engineering (2002 - present), he served as a lecturer (1990 ), associate professor (1994) and Professor (2000). Pollution Prevention and Control Process, Water Management system scale, waste resource management systems and pollution control technology to achieve a low-carbon pathway Process or low-carbon society. El Naggar is a Professor and Associate Dean of Engineering at Western University, Canada. He is Associate Editor of the Canadian Geotechnical Journal. He published 350 technical papers/book chapters on foundations, soil-structure interaction and geotechnical earthquake engineering; and consulted on major projects worldwide. He received numerous awards including: Stermac, Meyerhof, Canadian Geotechnical Colloquium Speaker, Western Faculty Scholar, Outstanding Teaching, and Research Excellence Awards. He was elected Fellow of Engineering Institute of Canada and the American Society for Civil Engineers. He also received the Ontario Professional Engineers Medal for Engineering Research & Development. Sergio Caserta was born in Naples in 1977; from 2016 he is Associate Professor at the Department of Chemical Engineering, Materials and Industrial Production, University of Naples Federico II. Graduated with honors in Chemical Engineering in 2001, he obtained a PhD in Chemical Engineering in 2004, dealing with morphology in flow of polyphase fluids. He worked at the Newcastle Technical Center at Proceter & Gamble, UK (2001) at the Department of Computational Science and Engineering at Nagoya University, Japan (2002, Prof. M. Doi. ), And at the Department of Mathematics and Biomedical Engineering , University of California, Irvine (2004, Prof. V. Cristini). The didactic activity focuses on thermodynamics and transport phenomena, and biomedical and biotechnological applications of the principles of chemical engineering. Research activities focus on: thermodynamics and microstructure transport systems, rheology, rheometry and reo-optics of non-Newtonian fluids and morphology of polyphase mixtures. Study of the dynamic evolution of cellular systems through automated time lapse microscopy techniques and image analysis. Transport of complex fluids into microstructured matrices. He is director of Panta Rei, a report from the Italian association of reolgia SIR and active as an auditor of several international journals in the areas of chemical engineering of biotechnology and biotechnology. Author of about 40 articles on peer review international journals and about 130 between book chapters and participation in national and inter-national conferences, 15 seminars and lectures on invitation, 4 patents for industrial invention. Prof Lucas has lead a team of researchers in the development of a novel process for the treatment of contaminated soils and polluted sediments. Based on their fundamental and applied research, Lucas and his team have designed, developed and commercialised a Thermal Desorption Treatment Process, capable of treating 30 Tonnes/hour of soils polluted with organic wastes such as tars, oils, pesticides and other environmentally hazardous chemicals. The development (over 12 years) has gone through the various phases of fundamental research, design and analysis, pilot plant trials, prototype fabrication and development to commercial ready process. The work has lead to a University Spin-Off company (Innova Soil Technology Limited). Highlights of the development include: AusIndustry R&D START Funding - Technology Demonstration (Lucas, 2001, $1,093,000), Recipient of Engineers Australia NATIONAL Award for Environmental Engineering Excellence (2003), US/AUS/CAN/EUR Patents. In addition to the contributions made to the field of advanced thermal desorption technology, Lucas has established a track record of research excellence in thermal process engineering, with particularly interests in waste processing/utilisation, coal utilisation (ignition and devolatilisation phenomena) and direct coal-iron ore reduction. In recognition of the quality and significance of his research, A/Prof Lucas received various prestigious awards; " Distinction Award for the Conference Paper Strezov V, Lucas JA, Osborn SR, Strezov L, Measurements of the Heats of Coal Devolatilisation, 16th Annual International Pittsburgh Coal Conference, Pittsburgh, PA, USA, October 1999. " Distinguished 2002 John Brodie Medal for the best paper at the CHEMECA 2002 for the work: McGann G, Evans T, Strezov L, Strezov V, Lucas JA, Iron Ore Characterisation during High Temperature Thermal Processing CHEMECA 2002, Christchurch, New Zealand, September 2002. " Engineers Australia (Hunter Region) Award for Engineering Excellence Innovation Award and Overall Winner (2003) for the project The Development of an Innovative Soil Remediation System " Engineers Australia National Award for Environmental Engineering Excellence (2003) for the project The Development of an Innovative Soil Remediation System. David Elena is a Graduate of Faculty of Chemistry and Chemical Engineering, MS-in Physics-Chemistry of Surface and Analytic Chemistry of “Babes-Bolyai” University from Cluj-Napoca, Romania. He serves as a Doctor in Chemical Science, Assoc. Prof., Head of Laboratory: Carbonic Materials, Composites & Analysis Techniques, at National Research Institute of Cryogenics & Isotope Technologies-ICIT Rm.Valcea, Romania. His overall research topics approached concern to renewable energy sources; conservation of energy; energy from waste; methods and mechanisms for the reduction of pollution; methods of waste recycling and tests to determine their toxicity; development of analysis techniques with applications in energy & environment fields. Sébastien Déon obtained his PhD degree from the University of South Brittany in 2007 on the modeling of transport through nanofiltration membranes. In 2008, he became Assistant Professor at the University of Franche-Comté where he has broadened his areas of expertise to electrokinetic characterizations of membrane materials and fouling cakes. Currently, he is Associate Professor and his skills are mainly dedicated to water treatment by membrane processes. He is also the Author or Co-author of one book, twenty four publications in international recognized journals, and twenty presentations in international conferences. His expertise in reviewing scientific papers led him to become an Associate Editor of International Journal of Membrane Science & Technology and an Editorial Board Member of several peer-reviewed journals such as International Journal of Chemical Engineering. Professor Tsuyoshi Fujita is a Director of Social Environmental Systems Research Center, National Institute for Environmental Studies (NIES), Japan. He is also an alliance professor of Nagoya University as well as a visiting professor of United Nations University in Japan. His research fields are eco industrial development, low carbon city, urban environment simulation system, circular economy planning and spatial LCA, where he has published around seventy journal papers. He is engaged in several national research projects to develop integrative urban technology and policy simulation system for Japanese and Asian cities and regions. He is a member of the National Council of Low Carbon City Promotion of Japan. He is also engaged in academic positions such as a counselor of the International Society of Industrial Ecology, Chair of Editorial Board, Journal of Environmental Systems Research, Japan Society of Civil Engineering. He received a doctor of engineering degree from the University of Tokyo in 1997 as well as a MCP (Master of City Planning) degree from the University of Pennsylvania in 1991. He was formerly an Associate Professor in Osaka University after working in the construction company as an urban planner for ten years. M. A. Martin-Luengo, graduated in chemistry at the Autonoma University of Madrid (Spain) in 1980. In the Consejo Superior de Investigaciones Cientificas (CSIC, Spain), she presented her Master work in 1981 and PhD in 1983 on the characterization of surfaces. Then she worked with a CSIC grant in England and Belgium till 1987. From 1987 till 1991, she was awarded a fellowship IA from the UK´s Scientific Engineering Research Council and from 1992 she is permanent research staff of the CSIC. Nowadays she carries out studies in the search for more sustainable materials and chemical processes based on preparing value added substances and materials from agriresidues, of outmost importance in less developed countries. Hui-Ming Wee is a Distinguished Professor in the Department of Industrial and Systems Engineering, former Associate Dean and Chaplain at Chung Yuan Christian University (CYCU) in Taiwan. He has received his B.S. degree (honors) from Strathclyde University (UK), M. Eng. from Asian Institute of Technology (AIT), and Ph.D. from Cleveland State University, Ohio (USA). He has received an excellent research award from the Taiwan Ministry of Science & Technology, excellent life researcher award and the Medal for Distinguished Industrial Engineer Award. He has published more than 400 papers in refereed journals, international conferences and book chapters. He was keynote speaker in a number of international conferences, Senior Member for Asian Council of Science Editors (ACSE), Board of Directors for International Engineering and Technology Institute (IETI). His research interests are in the field of production/inventory control, optimization, logistics, renewable energy, technological singularity and supply chain risk management. He holds a degree in Industrial Chemistry from the Federal University of Santa Maria (1997), a Master's degree in Metallurgical and Materials Engineering from the Federal University of Rio Grande do Sul (2001) using electrodialysis techniques and determination of heavy metals in effluents and a PhD from Federal University Of Santa Maria (UFSM) and Universität Freiburg, Germany - studies on drugs and active substances in hospital effluents and the use of Advanced Oxidation Processes in their treatment. He is currently a professor at the Sul-rio-grandense Federal Institute where, in addition to teaching / researcher activities, he is the Head of the Graduate and Postgraduate Teaching Department. He worked at IF Farroupilha in the years of 2010 and 2011, where he was course coordinator in this period. He worked at the University of Cruz Alta for 10 years (2000-2010), where he was in charge of the Coordination of the Degree in Chemistry Degree from 2002 to 2004, was part of the Consun from 2000 to 2006 and was responsible for the Laboratory of Water Analyzes of 2003 to 2005 and 2009. He was president of the Editorial Committee in his sector in this Institution. He has experience in Chemistry, with emphasis in Analytical Chemistry, working mainly in the areas of analytical chemistry, environmental analytical chemistry, environmental education, environmental chemistry and effluent treatment. Caroline is Chair of Engineering Education at UWA, Perth and has previously held appointments at the University of Sydney, Imperial College, UK and Queens University, Canada. Beginning her academic career in materials engineering, she has also gained qualifications, expertise and experience in education and social science and she now works at the juncture between these disciplines as well as between theory and practice. Caroline is particularly interested in ways in which engineering can help to create solutions for the environment as well as social problems. In 2006 she founded the not for profit organisation, Waste for Life (wasteforlife.org), which uses composites materials knowledge to co-create income streams for marginalised populations in different parts of the Global South. She also founded the Engineering, Social Justice and Peace network (esjp.org). Caroline is a Thomson Reuters Highly cited materials science author, with over 200 publications, papers and books on green materials, engineering education and engineering and social justice. -water resources management; -irrigation and drainage technology; -performance assessment of sprinkler irrigation systems; -modelling of transport processes in porous media ; -modelling and fluid-dynamics of debris and hyper-concentrated flows; -flood control and mitigation measures; -desertification and environmental impact of climate change. Diego Piazza has graduation at Tecnologia em Polímeros from Universidade de Caxias do Sul (2007), master's at Engenharia e Ciência dos Materiais from Universidade de Caxias do Sul (2011)and doctorate at Engineering from Universidade Federal do Rio Grande do Sul (2016). He is currently professor mestre (assistente) nível ii at Universidade de Caxias do Sul. He is currently a professor at the University of Caxias do Sul and has held the position of coordinator of the Polymer Technology Undergraduate Course at UCS from 2011 to 2016. He works in the field of polymer nanocomposites, coatings, materials recycling and the processing of polymeric materials by Injection, extrusion, thermoforming and rotomoulding. Participates in the UCS Entrepreneurship program. Integrates the group of researchers with The Ocean Cleanup (Holland) in the study of degradation and recovery of polymers from the marine environment. He has experience in the area of project development and research in the field of materials science and engineering, with emphasis on polymers, polymer materials processing, polymer nanocomposites, organic coatings, intelligent inks, powder paints, and materials recycling. Chemical engineering educator, researcher, administrator. (University Rector). Born in Athens, Greece, 1/3/1944. Father Gregory Markatos, mother Katerina Markatos. Married to Christine Kroussa. Father of three children, Nicolas, Jason and Katerina Diploma Chemical Engineering at the National Technical University of Athens in 1967. M.A. in Business Administration at the Athens School of Economics, in 1969. Diploma Imperial College, University of London 1973, PhD in Engineering, Imperial College, University of London, in 1974. Process manager in Procter & Gamble Hellas Industry in Athens, 1969-70. Research fellow at Imperial College London, 1973-75. Group leader CHAM Ltd, London 1975-78. Technical Manager 1978-82. Reader at University of Greenwich, London 1982-1986. Director of Section of Mathematical Modeling and Process Analysis, University of Greenwich, London, 1982-186. 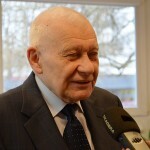 Professor of National Technical University of Athens since 1985. Director Computational Fluid Dynamics Unit, 1986 -. Head of Chemical Engineering Department, 1990-94. Rector of National Technical University of Athens, 1991-1997. Senior Visitor, Department of Applied Mathematics and Theoretical Physics, University of Cambridge, 2002-.2003 Fellow, Selwyn College, University of Cambridge, 2002-.2003, Visiting Professor University of Surrey,2002-.Consultant NASA Langley Research Center, National Maritime Institute, Combustion Engineering Boeing, Brit. Leyland, others. Visiting Lecturer Computational Fluid Dynamics Unit Imperial College, University of London, 1983-86. Referee International Journal Heat and Mass Transfer, Transactions of AIChE, Chem. Engineering Process, others. Editor : Computational Fluid Mechanics, 1987, Internal Combustion Engines, 1990. Co-editor journal Applied Math. Modeling, 1985 -. Author 4 books, over 200 scientific papers in field. Contributor many Articles to scientific publications. A chemical engineer and metallurgist with 6 years of research and student supervision experience (at University of South Australia) and involvement in more than 10 applied and fundamental project activities with problem solving and process optimization nature. Seven years of industry experience in chemical engineering and mineral processing. He completed his PhD (Doctoral Degree), University of South Australia, 2011. GradCert (Graduate Certificate), University of South Australia, 2010. Prof. Dr Muhammad Rusdy is animal scientist holding Doctor in Pasture Agronomy from Faculty of Agriculture Kyushu University, Japan. He is Full Professor in the Department of Forage Science and Grassland Management Faculty of Animal Science Hasanuddin University, Indonesia. He has published about 60 articles both in peer review domestic and international journals. Due to scarcity of feed in Indonesia, he has interested to study the establishment and growth of high potential forage that suitable to be developed in Indonesia. He also has interested to study the use of agricultural wastes as ruminant feed. and had published a book on it entitled Straw as an Alternative Feed for Ruminants and had presented his paper entitled Banana Wastes as Ruminant Feed in Recycling Expo that was held in Rome, July 2017. He has acted as reviewer for many journals, both indexed and non-indexed in Scopus. Dr. Madhav Datta is the Chairman of ACIRI and a Distinguished Professor in the department of Chemical Engineering and Materials Science. He has over 40 years of industrial and academic research experience having worked at IBM’s T.J. Watson Research Center, Intel’s Logic Technology Development, Emerson Network Power’s (ENP) Cooligy Precision Cooling, and the Materials Department of Ecole Polytechnique Federale de Lausanne (EPFL). His research interests include: Electronic Materials and Processing, Micro Cooling Devices, Wafer-Level Packaging, Joining Technologies, Electrochemical Processing, and Materials Characterization. Dr. Datta is an innovator with 48 issued US Patents.and is recipient of the Electrodeposition Research Award of the Electrochemical Society. Dr. Datta received his doctorate from the Materials Department of Ecole Polytechnique Federale de Lausanne (EPFL), Switzerland. He was awarded with Ninth Plateau of IBM Invention Achievement Awards and IBM’s Top 5% Patent award. He has authored 90+ publications and is the author/editor of several books on Electrochemical Processing & Micro/Nano electronics. He is recipient of the Electrodeposition Research Award of the Electrochemical Society. International Biographical Center, Cambridge, England included his name in outstanding scientists of the 20th Century in honor of his outstanding contribution in the field of Electrochemical Microfabrication. He has held several administrative positions including divisional chairs in the Electrochemical Society and the International Society of Electrochemistry. He has organized several international symposia and has presented keynote and invited lectures. Dr. Datta received his BS in Chemical Engineering from H.B. Technological Institute, Kanpur, MS from University of California at Los Angeles. Currently she is working as an Associate professor in Dept. of Urban and Economic Geography,Peking University, Beijing, China. TONG, Xin completed PhD in Economic geography, Peking University in 2003. She completed her Bachelor of Science, 1997 in same university. 3ith a backgro1nd of economic geography, or ind1strial geography more specifically,45m c1rrently interested in the spatial dimension of ind1strial ecology, both theoreticaland practical. 4 6orked on the E/tended Prod1cer 7esponsibility in e*6astemanagement in China, especially the response from the domestic ind1stry at this policy strategy at national, regional and local level for years, no6 e/tending theresearch interests to cover the relation bet6een the global environmental governanceand the technological change in developing co1ntries broadly. 4 also participate inseveral cons1ltancy proects, s1ch as regional ind1strial strategic planning or ind1strial park planning for local governments in Beiing, Sich1an, 8h1hai, 9ingbo,:oshan, Dongg1an, Shen;hen, etc..
Jalil was born in 1962 in Pabna district of Bangladesh. He enjoyed first grade junior scholarship, Education Board scholarship, and BUET merit scholarship. He received his B.Sc. in Civil Engineering in 1986 from BUET. He obtained his M.Sc. in Civil Engineering in 1988 specializing in Environmental Engineering from the same university. He received his Ph.D in Civil Engineering in 1993 from Tokyo University, Japan under Asian Development Bank Scholarship. He conducted post-doctoral research on water management in Loughborough University, UK under Commonwealth Fellowship during 2005-2006. Jalil was appointed as a Lecturer in the Department of Civil Engineering of BUET in 1986 just after his graduation. He was promoted to the post of Assistant Professor in 1989. He became an Associate Professor in 1996. He was appointed as a Professor in 2001. He has published over 37 papers up to now in international and national journals, proceedings of conferences and seminars. He presented a number of papers in home and abroad. He has worked a member of different committees of national organizations. He worked in a number of national and international research projects. He also works as a consultant and completed over 45 important national development projects. Cliff Hacking is President and CEO of the Electronic Products Recycling Association (EPRA). An internationally experienced leader, Cliff has achieved significant results through creating and managing high performance teams. Since launching operations in 2012, Cliff has: led the successful launch of new EPRA branded programs in the provinces of Manitoba and Quebec, welcomed existing programs from British Columbia, Saskatchewan, Nova Scotia and Prince Edward Island into the EPRA family and has overseen the expansion of Phase V products in our British Columbia program; making it the most comprehensive program in North America. Under Cliff’s leadership, EPRA has provided a steward interface and steward services for more than 3,000 program Stewards across Canada; collecting and responsibly recycling more than 25,000 tonnes of regulated, end-of-life electronics in 2012 alone. Ahn Ji Whan received a B.S, M.S and Ph.D degree in Mining and Minerals Engineering during the years 1986 ~ 1997 from Inha University and she has another master’s degree in Resources Environmental Economics from Yonsei University. Now Dr. Ahn is working as a Principal Researcher in Korea Institute of Geosciences and Mineral Resources, Director for Resources, Environment and Materials R&D Center, KIGAM, President for Korea Institute of Limestone & Advanced Materials (KILAM), Chairperson, Japan/Korea International Symposium on Resources Recycling and Materials Science, Vice President of Korean Society for Geosystem Engineering and Vice President of Korea Institute of Resources and Recycling.Dr. Ji Whan Ahn has published more than 154 papers, 716 proceedings papers/Conference presentations and 71 patents. She received many awards, National Science Merit (Presidential Citation Award), The Excellent Research award from Ministry of Knowledge Economy and The First Women Ceramist award etc., for her research excellence. 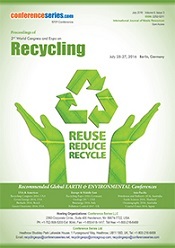 Accelerated carbonation processing, CO2 solidification, Carbon capture and storage (CCS), Carbon capture and sequestration, Powder technology, Ceramics, Nano materials, Waste management system, Environmental remediation technologies, Green Chemistry, Mineral resources, recovery and recycling, Mineral carbonation, Electrometallurgy. He received his Dr. Eng. Degree in Mechanical Engineering from the University of Pisa, Italy, in 1977 and pursued postgraduate education with fellowships from the University of Pisa and from the National Research Council of Italy (CNR). He completed his graduate and postgraduate education and training as a research associate at Brown University, Providence, RI, and at the University of Pennsylvania, Philadelphia, USA.Today, Paolo Dario is the Coordinator of the PhD Program in BioRobotics at SSSA, currently enrolling 92 PhD students. Sandro Donnini Mancini is Materials Engineer and has completed his PhD at the age of 31 years from Federal Universityof São Carlos. He was professor of the Chemical Engineering Department at Federal University of Ceará and he is now professor of Environmental Engineering Department at Universidade Estadual Paulista, Sorocaba Campus. He has published more than 30 papers in reputed journals. Dr. Fu-Shen Zhang is a professor and the director of Solid Waste Treatment and Recycling Laboratory at Research Center for Eco-Environmental Sciences, Chinese Academy of Sciences. He went to Japan in 1998 as a Japanese government scholarship student upon the selection of the Embassy of Japan in Beijing, and he got his Ph.D in the field of environmental engineering from Tohoku University (Japan). He also carried out post-doctoral research at the University of Michigan (USA) and Nagoya University (Japan). Since 2005, he has been worked in Research Center for Eco-Environmental Sciences, Chinese Academy of Sciences as a rewarded professor in “100-tenent” program. His recent research addresses effective recycling of solid wastes, including valuable materials recovery and functional materials development from e-waste, construction waste, municipal solid waste and bio-waste. Professor has guided tens of Ph.D, MSc students and several postdoctoral research fellows in the field of environmental engineering. He has published more than 30 peer review articles and obtained more than 10 patents in the past 5 years. Dr. Mangesh Madurwar is qualified civil engineer presently associated with Visvesvaraya National Institute of Technology (VNIT), Nagpur working on the position of Assistant Professor in Department of Civil Engineering. Prior to VNIT, Nagpur he was associated with National Institute of Construction Management and Research (NICMAR), Pune, India, working on the position Head of Post Graduate Programme in Real Estate and Urban Infrastructure Management (PGP REUIM). Mangesh has completed his doctoral research from Visvesvaraya National Institute of Technology, Nagpur. During his research he has developed the sustainable construction materials from Agricultural waste. He has more than 10 years of teaching, research, administrative and field experience in Green Construction Project Management. He was associated with the esteemed construction companies of India like M/s DLF Ltd, M/s Shapoorji Pallonji Company Ltd (SPCL), M/s Gammon India Limited. Dr. Mangesh is regular conference speakers and has published several research papers in prestigious national and international journals. In India, he has been actively involved in the development and deployment of several national professional training programs. He was also recognised by the Chartered Institute of Building (CIOB, UK) with Merit Award in the category of Innovation Achiever’s Award, in CIOB International Innovation & Research Award 2013. He has also associated with the M/s TUV SUD South Asia as a Technical Expert for the ISO Certifications Audits. He was involved in more than 35 quality audits of various construction companies in India. He has more than 10 years of teaching, research, administrative and field experience in Green Construction Project Management. He was associated with the esteemed construction companies of India like M/s DLF Ltd, M/s Shapoorji Pallonji Company Ltd (SPCL), M/s Gammon India Limited. Dr. Mangesh is regular conference speakers and has published several research papers in prestigious national and international journals. In India, he has been actively involved in the development and deployment of several national professional training programs. Iqbal M. Mujtaba is a Professor of Computational Process Engineering and is the Head of the School of Engineering. He is a Chartered Chemical Engineer, a Chartered Scientist and is a Fellow of the IChemE. He is currently an executive member of (a) IChemE Computer Aided Process Engineering Subject Group (Secretary 2000-2010; Chair 2015 - ), (b) the European Committee for Computers in Chemical Engineering Education (Secretary 2007-2010; Chair 2010-2013) and (c) Chair of BUET Chemical Engineering Forum, Bangladesh (2016 -). Professor Mujtaba was the member of the University Senate from 2002-2010 and was members of a number of committees including University Equality & Diversity committee, University Research Degree committee (Deputy Chair), School Board and School Executive Committee, School HR committee (Chair). Senior researcher Armenian Institute Agriculture, Echmiadzin, 1980—1989; science leader Technological Institute Amino Acids, Minister Medicine & Biological Industry Union of the Soviet Socialist Republics, Yerevan, 1989—1993; president Research & Industry Center Photosynthesizing Organisms, Feed Additives & Physiologically Active Compounds, since 1991; director Yerevan Vitamin Plant, 1998, director of Armenian Institute Biotechnology, Yerevan, 1998—2008; deputy director Nairit Chloroprene Rubber Plant, since 2000; Expert Council Chemistry & Petrochemistry Commonwealth of Independent States Countries, Moscow, since 2002, Expert of FP6, FP7, Horizon-20020, ERA.NET and International Cooperation (InCo) programs of European Union, Brussels, since 2003; Contributor articles to professional journals (J. Clean Technologies & Environmental Policy award, 2008). Armen Borisovich Avagyan, R & I Center of PO, FA and PAC company sole founder. Achievements include development theory of global sustainable development leading to resolution global tasks facing the world community (Theory of Global Sustainable Development based on including of microalgae in Bio and Industrial Cycles. New Design and Building of Biological System. Amazon). Ana Matin, Ph.D. is Assistant Professor at the University of Zagreb Faculty of Agriculture. She obtained her Ph.D. at the same Faculty in 2012. Matin works at the Faculty of Agriculture since 2004, and during that period was project manager, or a collaborate of numerous Croatian and international scientific and technological projects. She is an author or co-author of more than 70 scientific end expert papers and books. As a member of the scientific or organization committee of several conferences. Matin is secretary of Almae matris Alumni Croaticae – Facultas Agriculturae Zagrabiensis. Also she is actively invloved in teaching for more than 10 years. Postharvest technology; Drying and storing of agricultural products and flowers; Biofuels production; Biomass and waste utilization; Animal feed production technologies. Prof. Hussam Jouhara is an associate professor in Brunel University London. Since obtaining his PhD from Manchester University in 2004. He has unique expertise in working on applied heat exchangers and energy-related research activities with direct support from research councils and various UK and international industrial partners. He has extensive expertise in designing and manufacturing various types of heat exchangers, including heat pipes and heat pipe-based heat exchangers for low, medium and high temperature applications. Throughout his academic and industrial career, he received over £6.5M in research funding from various UK/EU based research councils (RCUK & EU H2020) and from British and European industrial partners. He is a published author of many journal papers, academic books and many filed patents in areas related to heat pipes engineering and manufacturing and Energy from Waste systems. He is a Chartered Engineer and Fellow of both Engineers Ireland (Ireland) and IMechE (UK). He has extensive expertise in designing and manufacturing various types of heat exchangers, including heat pipes and heat pipe-based heat exchangers for low, medium and high temperature applications. His work in the field of heat pipe based heat exchangers resulted in novel designs for recouperators, steam generators & condensers and flat heat pipes. These have been implemented across various industries including, but not limited to: food, electronics thermal management and low to high industrial waste heat recovery and Energy from Waste. Over the last few years, he has successfully managed to achieve new designs for industrial waste heat recovery and many thermal systems that have enhanced the performance of various industrials processes in the UK, Europe and world-wide. His latest invention relates to a new Waste to Energy system that converts municipal waste to fuel that can be used to heat our homes. The new system was developed in collaboration with Manik Venture and Mission Resources and is called: Home Energy Recovery Unit (HERU). Professor, Aoyama Gakuin University, 2012 to present. Visiting Researcher, Institut de Ciència i Tecnologia Ambientals (ICTA), Universitat Autònoma de Barcelona (UAB), 2015-2016. Visiting Researcher, National Institute for Environmental Studies of Japan, 2011-2013 Associate Professor, Aoyama Gakuin University, 2007 to 2011. Associate Professor, Kansai University, 2003-2006. Visiting Professor, Department of Economics, Duke University, 2003. Assistant Professor, Kansai University, 2000-2002. Research Economist, International Development Center of Japan, 1998-1999. Andrzej L. Wasiak is involved in several research topics belonging mainly to the area of production engineering. His interests are focused on experimental studies as well as mathematical modelling of various processes important for creation of materials, products or harvesting of energy, especially from renewable resources. 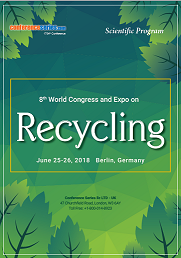 Results of research concern phase transitions occurring in production technologies, energetic effectiveness of biofuel production, and studies of recycling processes in relation to the idea of sustainable development. In his approach sustainability is idealized notion that can be realized only as asymptotic solution i.e. at any instant of time only with some limited accuracy. Therefore seeking for appropriate measures is an important scientific task. Professor Wasiak is the active academic teacher, and also a member of several Polish and International Scientific Organizations. Name : Prof. Dr. Hamidi Abdul Aziz Nationality : Malaysian Age: 52 Current Position : Professor, School of Civil Engineering, Universiti Sains Malaysia (USM) Qualification : Ph.D.
His area of research interests includes Hybrid Reinforced/Filled Polymer Composites, Advance Materials: Graphene/Nanoclay/Fire Retardant, Lignocellulosic Reinforced/Filled Polymer Composites, Modification and Treatment of Lignocellulosic Fibres and Solid Wood, Nano Composites and Nanocellulose fibres, Polymer blends. He is currently working as Senior Research Fellow (Associate Professor), at Biocomposite Technology Laboratory, Universiti Putra Malaysia, Malaysia and also Visiting Professor at Department of Chemical Engineering, College of Engineering, King Saud University, Riyadh, Saudi Arabia. He is working in composite field since 2008 and having 10 years of experience in teaching, research in the field of composites. Presently he is supervising 15 PhD and 5 Master students and has several Research grant at University/National/International level on polymer composites of around RM 3,000,000 (USD 700,000). So far he has published 12 books, 27 book chapters, and more than 175 International research and review articles in reputed Journal in the field of Composites and allied field. Dr. Park is a professor of the Civil and Environmental Engineering Department at the University of Wisconsin-Madison. He received a B.S. in Civil Engineering at Yonsei University in 1977 and a M.S. in Environmental Engineering at Seoul National University in 1979. He worked as a consulting engineer in Korea and Australia for two years after serving two and a half years of military service. He received a Ph.D. in Public Health Engineering at the University of Newcastle upon Tyne, United Kingdom in 1985. He worked as a research engineer at the Sanitary and Environmental Health Research Laboratory, University of California, Berkeley from 1985 to 1988. Since he joined University of Wisconsin-Madison in 1988, he has taught environmental engineering courses such as water treatment plant design, wastewater treatment plant design, biological treatment, physical/chemical treatment, hazardous waste management, solids and hazardous waste engineering, industrial water pollution control, etc. His research is in the areas of water quality management and river restoration; biological treatment; hazardous waste treatment; mass transport in the environment; fate of organic compounds in water and wastewater treatment processes; computer-aided design of water and wastewater treatment plants; and reuse of scrap vehicle tires as a contaminant sorbent. He has published one book and over 200 journal articles. He has been a consultant to many governments, institutions, utilities, and companies from all over the world. Prof. Agamuthu is a Senior Professor at the University of Malaya (UM) and is the Founder-President of the Malaysian Society of Waste Management and Environment. He is also the Vice-President/International Advisory Board Member – Society of Solid Waste Management Experts in Asia and Pacific Islands (SWAPI) and an honorary member of the International Solid Waste Management Association (ISWA). He is the Founder-Head of the Center for Waste Management Research, UM. He is a Fellow of the Academy of Science, Malaysia and a Fellow of Institute for Global Environmental Strategy, Japan. Dr Hazizan Md Akil is currently a full professor of polymer composites in the School of Materials and Mineral Resources Engineering, Universiti Sains Malaysia. Professor Hazizan received his PhD degree in Composites Materials from the University of Liverpool, UK, in 2002. He was promoted to Associate Professor in 2008 and a full Professor in 2012. His main research areas are on Natural Fibre Reinforced Composites, Nanocellulose from Lignocellulosic Biomass and Biocomposites. He has published several book’s chapters and more than 200 journal articles. Prof. Hazizan has a total citations of more than 4000 and an h-index of 31 and an i10-Index of 85 (Google Scholar – 8 January 2018). He is currently an editorial board member for Materials & Design journal (Elsevier), Regional Editor for the Journal of Applied Sciences (Scialert), Regional Editor for Trends in Applied Sciences Research (Scialert). Ann T W Yu has a BSc degree in Building from University of Brighton, UK and MSc degree in Construction Management from City University of Hong Kong. She has obtained her PhD from the Department of Building and Real Estate, The Hong Kong Polytechnic University in 2007. She has started her profession as an Assistant Architect and worked for a number of different professional firms including architectural firms, quantity surveying practice as well as the Hong Kong Housing Authority. She was appointed as an Assistant Professor in Value Management and Construction Management by the Department of Building and Real Estate of The Hong Kong Polytechnic University in 2007. She has a strong track record and has published extensively on the broad theme of project management in leading construction management journals and international conference proceedings. Dr. A. K. M. Rashidul Alam is an Associate Professor of the Department of Environmental Sciences at JU, Dhaka -1342, Bangladesh (http://www.juniv.edu/teachers/278). He acquired Ph.D. degree from Graduate School of Environmental Sciences of Hokkaido University, Japan. Since 1999, he has been conducting research on various aspects of environmental issues, especially on wastewater treatment with aquatic macrophytes (phytoremediation) and microbial remediation of xenobiotic compounds, freshwater ecology and biodiversity, marine bioinvasion, biomonitoring of pollution, climate change and indigenous adaptation practices. He is a life member of Bangladesh Botanical Society, Asiatic Society of Bangladesh and one of the members of Ecological Society of Japan. His research outcomes (40 scientific papers) have been published in both home and abroad. Dr. Alam presented scientific papers in various national and international conferences and has been achieved the best speaker/presentation awards several times. Dr. A. K. M. Rashidul Alam officiated as Session Chair for the sessions of various scientific events of National and International Conferences in both home and abroad. His topics of interest include Groundwater Hydrology, Irrigation and Drainage Engineering, Sustainable Development and Environmental Assessment, Climate and Integrated and Sustainable Water Resource Management, Water System Engineering, Water Resources Planning, Artificial Neural Network, and Genetic Algorithm. Prof. Kunio Yoshikawa was born in 1953 in Tokyo, Japan. He is a professor of Tokyo Institute of Technology and an associate editor of Applied Energy. His bachelor, master and doctor degrees were awarded from Tokyo Institute of Technology. His major fields are energy conversion, waste management and environmental engineering. He has been working in Tokyo Institute of Technology for more than 38 years as a research associate, an associate professor and a professor. He has published nearly 200 journal papers with the major award of AIAA Best Paper Award, ASME James Harry Potter Gold Medal, JSME Environmental Technology Achievement Award and Best Educator Award of Tokyo Institute of Technology. Nowadays she carries on with her studies on sustainable issues, applying the knowledge acquired during 34 years of career to the search for the use of renewable materials, chemical processes and energies, especially giving priority to countries with deprived economic resources. Nour-Eddine Menad has completed his PhD from National School of geology of Nancy (France) and worked as Associate Professor at Technical University of Lulea (Sweden). 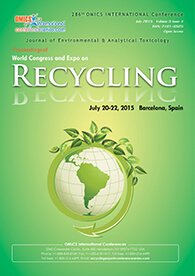 He is scientific expert on process development on recycling of industrial wastes. He has published more than 100 papers in reputed journals and conferences, 4 patents and is in the board committee of Edorium Journal of Waste Management. At the moment, he is working at BRGM (Bureau de recherché Géologique et minière) on development of separation techniques applied on the urban mine to recover stratégic metals. Enric Vazquez is Professor Emeritus in Construction Materials on the ETS Ingenieros de Caminos of the Universitat Politecnica de Catalunya. At present in Constructing Cycle SL. Research in eco-efficient materials and wastes for his use in construction, environmental impact by leaching, road pavements, durability of concrete and bituminous mixtures. 80 papers and books published from 1967 til today.This publications include the books Progress of Recycling in the Built Environment,Vol 8,RILEM STATE OF ART REPORTS “2013” y Guia Española de Áridos Reciclados procedentes de RCD (2012),Ministerio de Medio Ambiente y GEAR. He has oriented 22 doctor thesis and 30 master th..Invited Plenary Speaker in Spain, Japan,France,Germany,Austria,Poland,Brasil,Italy,Portugal and China. Has been Chairman from the RILEM TC-217 y TC-198 URM.Member of WG of AENOR,AIPCR and CEN.In 2011 he received the Environment Award from the Catalan Government for his profesional career. Awf Al-Kassir, male, Professor Industrial Engineer, (Ph.D.) from Valladolid University in 1995, graduated (B.Sc.) from mechanical engineering department, Mosul University in 1978. He worked for University of Technology of Baghdad in 1979 and Institute of Technology of Ramady 1980-1988 after getting his (M.Sc.). From 1989-1994, he worked as a researcher and associate professor at the University of Valladolid in Spain. From 1995 up to date he worked as a professor at the University of Extremadura in Spain. He was invited professor at TUBITAK research center of Turkey during the academic year 2009-2010. Also he is the coordinator of Master Bioenergy Subject & lecturer at the Polytechnique Institute of Portalegre in Portugal, 2010-2012. Now he has published more than 150 papers and contributed more than 80 communications to congresses & other books. He participated in national research projects, he was a member of ASHRAE from 1989-1995, he was accepted for colligate in the engineering college of Spain since 1990. Stéphane Bourg is Project Manager at the French Atomic Energy and Alternative Energies Commission in the Radiochemistry and Processes Department located in the CEA Marcoule Research Center. He is in charge of projects dealing with hydrometallurgical process simulation and life cycle assessment studies. Since 2008, he has been the Coordinator of European research projects dealing with solvent extraction process develoment (ACSEPT, SACSESS) and of research infrastructure networks (ACTINET-I3, TALISMAN). He is the Chairman of the Executive Committee of PROMETIA, an international non-profit association aiming at promoting the development of mineral processing and extractive metallurgy for mining and recycling. This association, gathering academia, research and technology centers and industries, acts as a pre-consortium tank for answering industry R&D needs and fostering innovation in mineral processing and extractive metallurgy. Stéphane Bourg graduated as an Engineer from the Ecole Supérieure de Physique et Chimie Industrielles de Paris and is Doctor in Chemistry. From 1992 to 1998, he carried out research work on silicon organochemistry, applied to advanced silicon carbide material synthesis. He joined the CEA in 1999 as research engineer for developping sol-gel organo modified silica materials dedicated to liquid effluent decontamination . In the years 2000, he was involved in pyrometallurgical process development. He has been a member of expert groups regarding nuclear waste management issues (IAEA expert groups following Fukushima accident), nuclear fuel cycle research programmes (UK EPSRC), raw materials (EIP-RM working groups). He is also member of several advisory boards and international conference committees. Francois O. Méar has completed his PhD at the age of 29 years from Montpellier II University and postdoctoral studies from Cambridge and Tohoku University. He is assistant professor at Lille I University and specificly in the Catalysis and Solid State Chemistry Unit. FOM is working on the formulation of glass matrices for unconventional applications (e.g. containment matrices for nuclear waste, seals glass for SOFC) and on the synthesis of self-healing glassy matrices. He has published more than 35 papers in reputed journals, 1 patent and 2 book chapters. Helena Maria Vieira Monteiro Soares has completed her PhD from University of Porto, Portugal. Her main research is focused on the selective recovery of metals from wastewaters and secondary resources. She has published about 70 papers in ISI journals, coordinated several national projects and has been serving as Project Evaluator of advanced fellowships and grants from the Portuguese and other international (EU, South Africa, Chile) research agencies. Ashraf Bakkar has obtained his PhD in Materials Engineering and Corrosion from Technische Universität Clausthal, Germany, May 2005. He conducted his scientific research and development in the field of Corrosion and Electrometallurgy in Institut für Materialprüfung und Werkstofftechnik Dr. Neubert (DN) GmbH at Clausthal, Germany (2005-08). He worked as Assistant- and Associate-professor in Metallurgical and Materials Eng. Dept., Suez University, Egypt (2008-2013). He is the Head of Environmental Eng. Dept. at Umm Alqura University, Saudi Arabia. His scientific co-operation with Prof. Neubert (Director of DN) has been continued since 2001. They are currently conducting recent research on recycling of dusts evolved from different Egyptian and German steelmaking fields. He has about 35 scientific contributions published as patents, journal papers, and conference articles. Vasilis Fthenakis is a Director, Center for Life Cycle Analysis at Columbia University, USA. He also leads the National PV Environmental Health and Safety (EHS) Research Center operating at Brookhaven National Lab (BNL) under the auspices of the DOE since 1982. He is a Fellow of the American Institute of Chemical Engineers and the International Energy Foundation. Hesham Ali, Ph.D., P.E., CPM, came to FIU with over 21 years of civil engineering experience, mostly in pavement design, analysis and construction. Ali joined the CEE faculty in December of 2011 as Green Paving Professor of Practice and is working to advance the new Green Paving Initiative of Florida International University. Ali earned holds a Master’s degree in Transportation Engineering and a Ph.D. in Civil Engineering from The City University of New York. He has spent much of his career in the transportation sector focusing on pavement evaluation, pavement engineering and consulting for various public and private employers, including a role as Highway Research Fellow for the U.S. Federal Highway Administration. Additionally, Ali has participated in the delivery of hundreds of roadway and airport construction projects in New York, Maryland, Pennsylvania, Texas, Virginia and Florida. Recently, Ali served as an executive at the Florida Department of Transportation, where he worked for over a decade and participated in the delivery of $3 billion of highway construction and maintenance projects. Andreas Krause has completed his PhD at the age of 32 years from Georg-August-University Göttingen. He is the Professor for wood composites and processing technology at University Hamburg. He has published more than 50 papers in reputed journals. Miklas Scholz is a Fellow of IWA holds the Chair in Civil Engineering at The University of Salford. He is the Head of the Civil Engineering Research Group and has published two books and approximately 150 journal papers. His main research areas are wetland systems, storm water management, sustainable drainage, biological filtration, water quality and wastewater treatment. Prof. Scholz is Editor-in-Chief of the ISI Web of Science-listed journal Water (impact factor for 2012: 0.973). He has membership experience of over 30 editorial boards. Wetlands, sustainable drainage, biological filtration, water quality, storm water management and wastewater treatment. Jorge Manuel Calico Lopes de Brito is currently working as a professor in department of civil engineering at University of Lisbon, Portugal. He completed his Phd in civil engineering department in 1993. He is Editor-in-Chief of Journal of Building Engineering and Associate Editor of European Journal of Environmental and Civil Engineering Editorial Board. He participated in several international conferences. Irene M. C. Lo is currently a full professor in the Department of Civil and Environmental Engineering at The Hong Kong University of Science and Technology (HKUST) and has been joining HKUST since 1992. Prof. Lo is an elected Academician of the European Academy of Sciences and Arts (EASA). She is the first Hong Kong scholar inducted into the EASA. She is an elected Fellow of the Hong Kong Institution of Engineers (FHKIE), and elected Fellow of the American Society of Civil Engineers (FASCE), She received her Ph.D. degree in Civil (Environmental) Engineering from the University of Texas at Austin in 1992. She is also Adjunct Professor of Tongji University, Tianjin University, Jilin University and Harbin Institute of Technology in China. She had been Visiting Professor of Technical University of Denmark and the University of Wisconsin at Madison. Prof. Lo was the recipient of the 2004 ASCE James Croes Medal, the 2007 ASCE Samuel Arnold Greeley Award, the 2008 EWRI Best Practice-Oriented Paper Award, the 2009 ASCE Wesley W Horner Award, and the 2012 ASCE EWRI Best Practice-Oriented Paper Award. Prof. Lo has held 2 Patents, edited 7 technical books, and published over 260 SCI journal articles and conference papers with citation about 4500 and H-index of 35. Her research areas include remediation technologies for river sediment, contaminated soils and groundwater; magnetic nano- and microparticles for environmental pollution control; pollutant migration in soils; and waste treatment and management.